CINCINNATI — It was an exception to the rule, said Cincinnati Zoo and Botanical Garden Director Thane Maynard, and it could have been a lot worse when a young boy climbed into the zoo’s gorilla exhibit Saturday. Maynard defended his staff’s decision — and applauded their quick reaction time — when they shot and killed a 400-pound, rare silverback gorilla, Harambe, after it was seen dragging a 3-year-old boy who had climbed into the exhibit. The Texas zookeeper who raised Harambe, Jerry Stones, told the New York Daily News that, while the gorilla's death saddens him, he thinks Maynard's team made the right call. “The child was in danger. It’s a tragic set of circumstances that left a beautiful young gorilla in a situation that was foreign and ultimately ended up being dangerous for him,” Stones said. Maynard also stressed that the zoo is “a safe place,” explaining that the zoo’s accreditation with the Association of Zoos and Aquariums must be renewed every five years, in addition to a biannual review by the U.S. Department of Agriculture. Maynard estimated nearly 1 million children visit the zoo each year. “Safety is always a primary concern,” he said. Harambe’s species, the western lowland gorilla, is on the endangered list. Maynard said the gorilla’s nickname among the zoo’s keepers was “Handsome Harambe,” and that he was known as smart and empathetic. 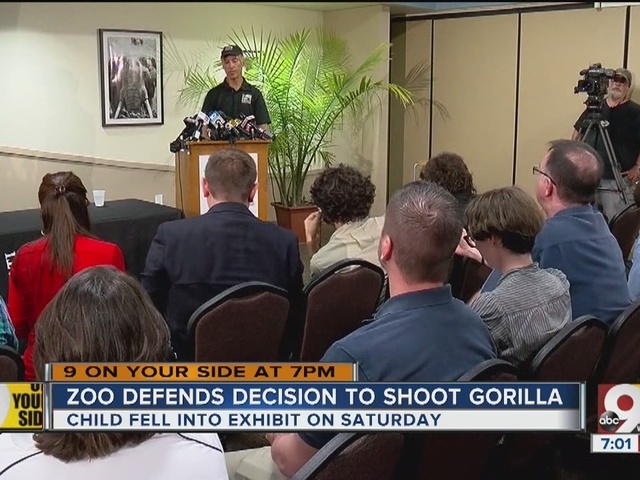 Maynard also said the zoo would not press charges against the family of the boy who climbed into the exhibit, after outcry on social media has called for repercussions for the parents in the days following the incident. As of late Monday afternoon, an online petition asking lawmakers to enact “Harambe’s Law” — which would create penalties for people who cause dangerous situations or death to an endangered animal — had gotten more than 86,000 signatures. 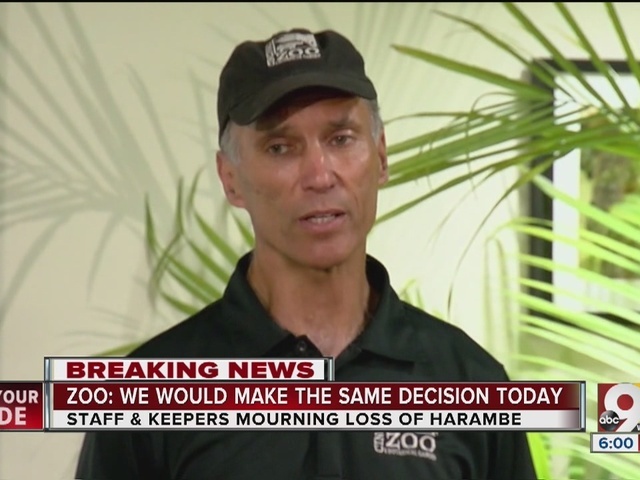 Maynard said Harambe was the first animal that the zoo’s Dangerous Animal Response Team has had to put down in the zoo’s history. Video footage captured by a zoo patron shows Harambe dragging the boy through the enclosure before zoo officials intervened. Correction: An earlier version of this story misidentified the child's age, based upon information provided by the zoo. A spokeswoman for the boy's family indicated Monday that he is 3 years old. WCPO regrets this error.